As solar power is derived from the sun, it makes sense to be maximising your energy usage during the day when the sun is shining. 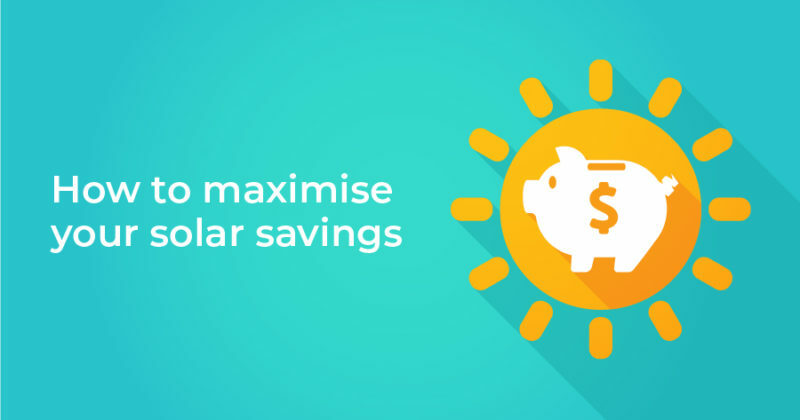 Using majority of your solar power as it’s generated rather than sending it back to the grid for a feed-in tariff will provide you with the best savings. Feed-in Tariffs for West Australians currently sit at 7 cents per-kilowatt hour, and the rate at which you pay for electricity is 28 cents. Each time you use a unit of energy generated from your solar system, you save 28 cents rather than only earning the 7 cents from your feed-in tariff. Self-consuming your solar energy is much more financially viable and a better use of your investment. With a few behavioural changes and formation of new habits, you can easily start to maximise your solar energy consumption. The most energy-intensive household items include your washing machine and dishwasher. Using these will usually cost you about 20-50c a load. While that may not seem like much, if you use these appliances multiple times a week, over the course of the year it adds up. If you can, set a timer to have these appliances start at certain times during the day or switch them on just before you go to work. North facing panels are the most ideal position for consistent sunshine throughout the day, so if you have the benefit of a north face, you can spread your usage throughout the day. If you have panels on your east facing roof, most of your power generation will be produced in the mornings as this is where the sun rises, so schedule your big appliances for this time. If you have west facing panels, you could use majority of your larger appliances in the afternoon. A useful way to understand where your electricity consumption is coming from is through online monitoring systems. These platforms, when used in conjunction with a smart meter, can provide real-time data of your household electricity consumption, solar production and the amount of excess solar power being exported to the grid. Understanding your electricity usage will help you to make educated decisions on how to best utilise your self-generated solar power. Heating and cooling your home through your air conditioner can be a costly comfort. However, if timed correctly, you can often run your air conditioner on solar power alone. If you’re out during the day and want to come home to a cool or warmer home, time your air conditioner to come on in the afternoon to set the temperature to your preferred level so you won’t have to run it through the night. Switching to charging your phone, laptops and tablets during the day where possible is a simple way to better utilise your solar energy. However, for most people, charging your phone during the day can be difficult as they’re usually at work and take their phones or laptops with them. In this case, you can try charging your reusable batteries or portable charger during the day while you’re at work and plugging them into your devices at night. This way you still wake up with a fully charged battery and have used your self-generated solar to power them. Your backyard swimming pool will easily be one of the most energy-intensive and cost-consuming assets at your house. The costs of running a swimming pool can be anywhere from $800-$1200 a year. Using your PV system to power your pool pump will see your electricity bills significantly drop. We recommend running your pool pump from 10am-3pm over summer, and 11am-1pm over winter to maximise solar self-consumption. Often cordless operated appliances are battery charged, and therefore require recharging. Just like the electronic devices, you can charge your appliances during the day when your solar system is producing energy. The cold weather will be here before we know it, but this doesn’t mean your system won’t be of any use during the winter months. Winter is an ideal time for hearty slow-cooker meals, and the greatest part is that you can leave your slow cooker on during the day whilst you’re at work, powered by your solar system. You can also do this with bread makers, which usually requires about 3-4 hours of cooking time. If you don’t have the ability to be at home during the day, investing in smart home technology could be the solution. Smart home tech uses devices which are connected through the internet to control and automate their functions through an app or monitoring system. Smart home tech can perform multiple functions, such as controlling your appliances to be switched on and off as you please, regulate the temperature of your home and lighting control. By incorporating this technology into your home, you can control your appliances to work during the day and maximise your solar energy consumption. Your solar PV system is a significant investment for your home. Understanding the best ways to utilise it will provide you with the biggest benefit. If you’d like more information on how solar can work for your home, please contact us today.